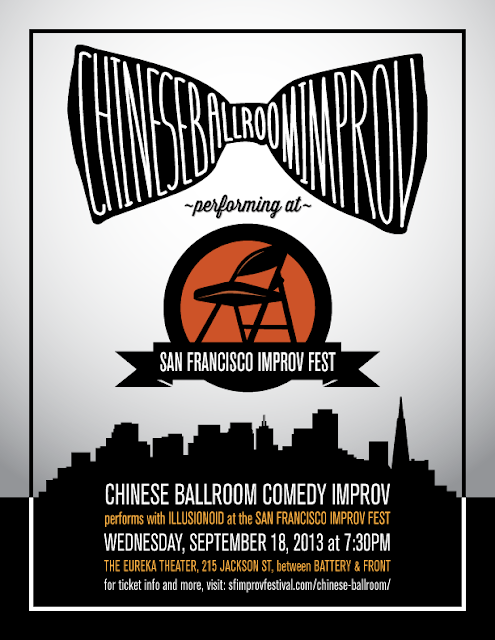 Chinese Ballroom has been selected to perform at the annual San Francisco Improv Festival, and we're happier than Andy at Burning Man about the whole thing. (True fact, Andy's a burner, ya'll). But seriously, our performance is next week, and seeing our fans there would make us giddier than Michelle learning the moves to a Beyonce flash mob dance! The show is: Wednesday, SEPT 18th, 7:30pm, at the Eureka Theatre in downtown San Francisco! We'll be sharing the stage with a team called Illusionoid who are CANADIAN, YOU GUYS so this is pretty much an international extravaganza.